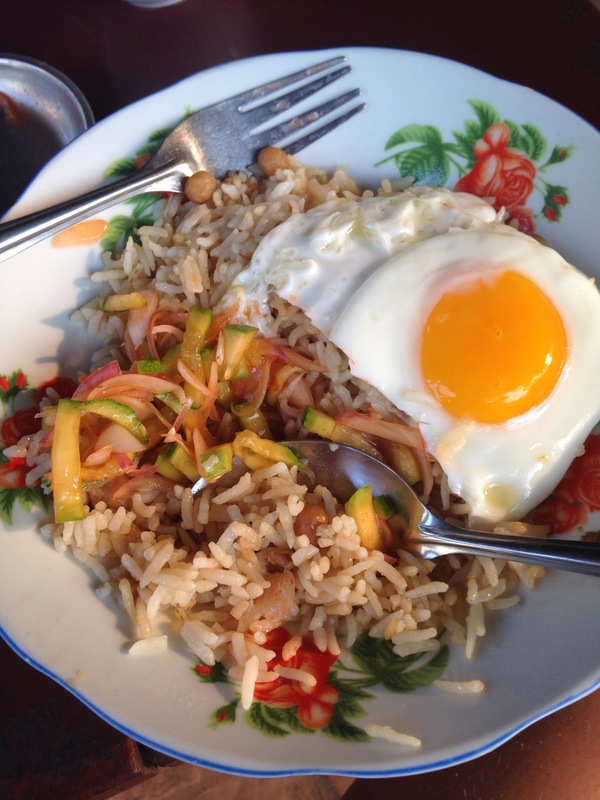 Three tell-tale signs you are in Myanmar! As soon as you arrive in Burma, there are three distinctive cultural practices that you cannot fail to notice. Everybody in Myanmar wears a longyi, a piece of long fabric attached together by a single seam and tied at the waist. Men tend to wear checked or plain fabrics and pleat at both sides of the hip so they can tie in the middle. When done neatly this gives the impression that they are wearing baggy trousers. 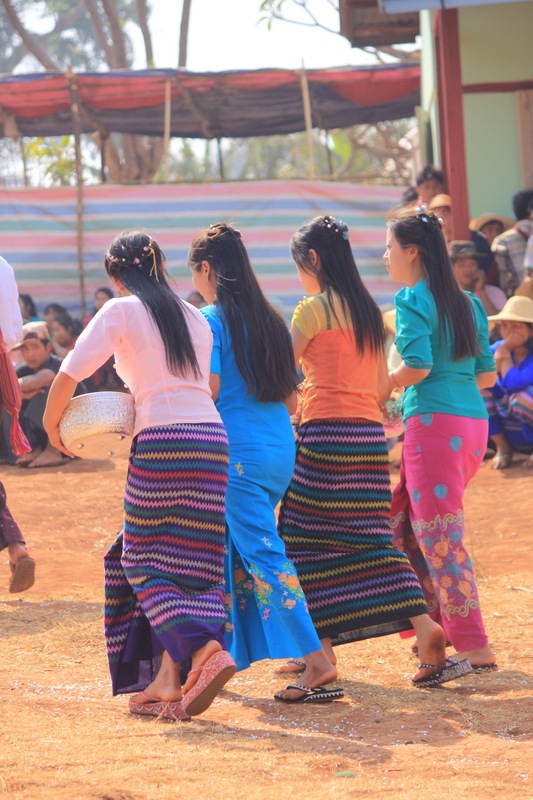 Women generally fold their longyis just once at the hip and tie or tuck to make a sarong like skirt. They wear longyis of all different patterns and colours. They can be hitched up to different lengths – men who work on boats can often be seen tying theirs up to resemble nappy like shorts. 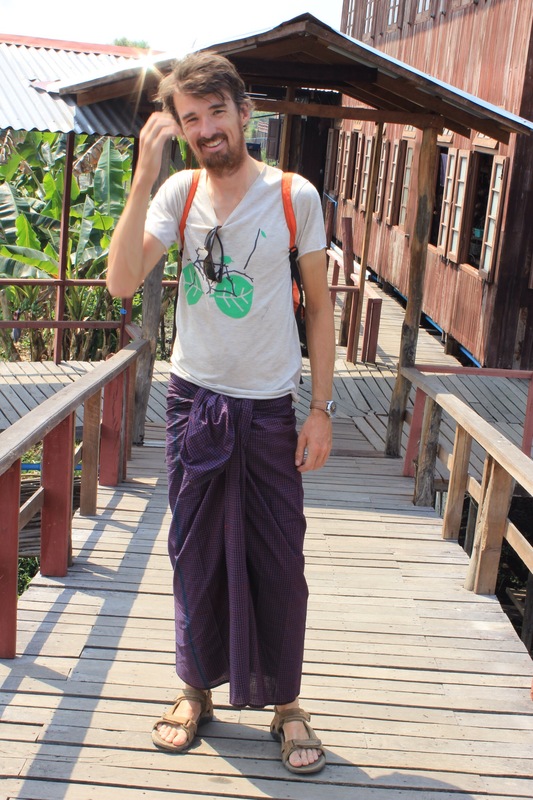 Most tourists come away from Burma with a souvenir Longyi – here is Paddy modelling his! Pretty much everybody in Myanmar covers their faces in a pale yellow paste called thanaka, which is made by grinding the bark of the thanaka tree (a kind of sandal wood) with water to form a liquidy paste. 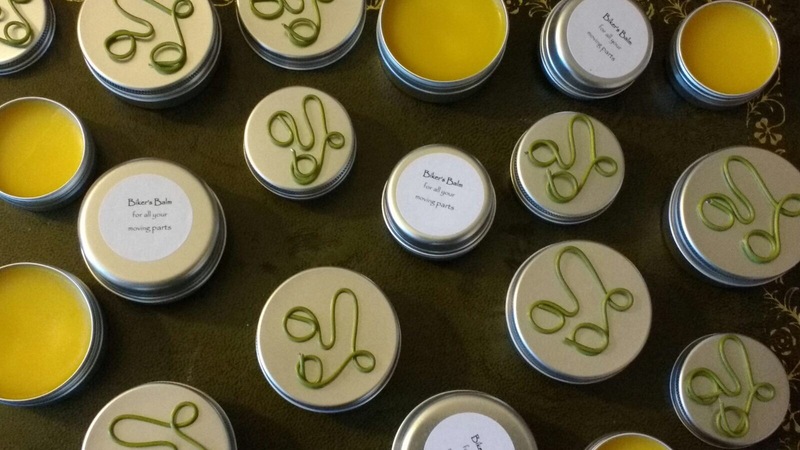 This is then applied to the face in a variety of ways, depending on the preference (and age) of the wearer. Thanaka works as a natural sun screen, so you will often see the faces of older women and lots of children completely smothered in the stuff giving a ghostly-like appearence. Applying to just the cheeks and nose is also very common. But it is also used as decoration and many young women (and some teenage boys) will carefully paint artistic lines and spots on their cheeks and around their eyes. Walk down any street or glance at any car door and you won’t fail to notice splatters of red which look horribly like dried blood! This is the tell tale sign of just how many Burmese (the majority of them men) are addicted to chewing betel quids which contain the areca nut. 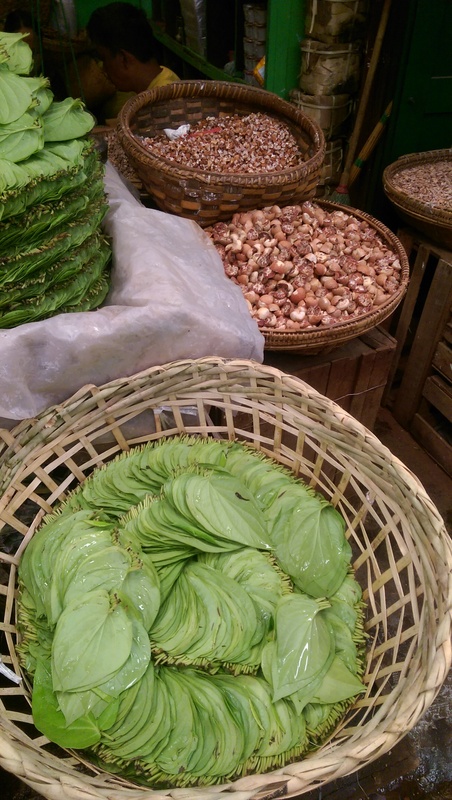 The nut is often combined with tobacco (and sometimes other flavours like sweet coconut or dried mango) and wrapped in a betel leaf to make a small parcel called a quid. This is then covered in slack lime. When chewed slowly in the mouth your saliva turns a dark red and it is important you spit the liquid out which is why so much of the road and car doors are covered in the stuff. It is a very addictive habit and regular use stains your teeth and gums giving you a vampire like smile and results in terrible dental problems (oral cancer) later in life. 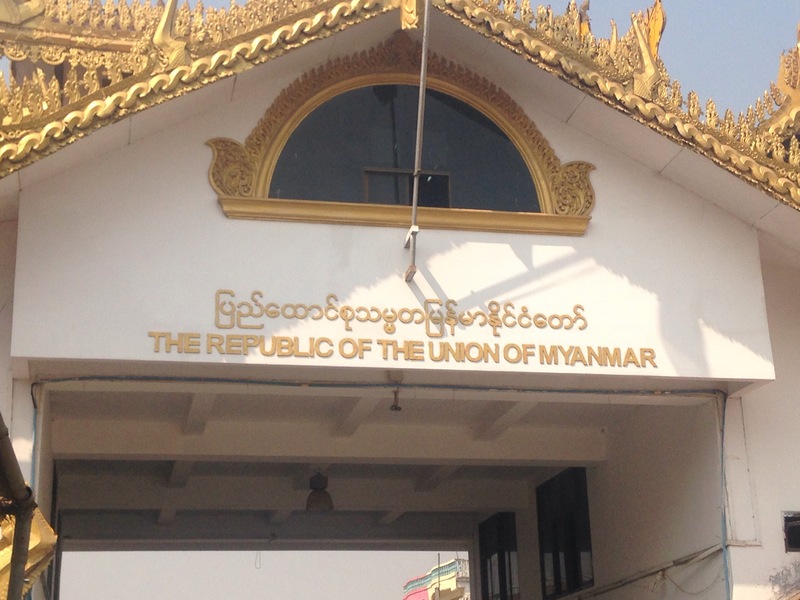 Due to the limited 28 visa situation in Myanmar we have a stricter schedule here than usual. Myanmar is a BIG country and we will be spending what promises to be a great week with the two ‘Sheen Seniors’ who we are meeting in Mandalay on the 21st. 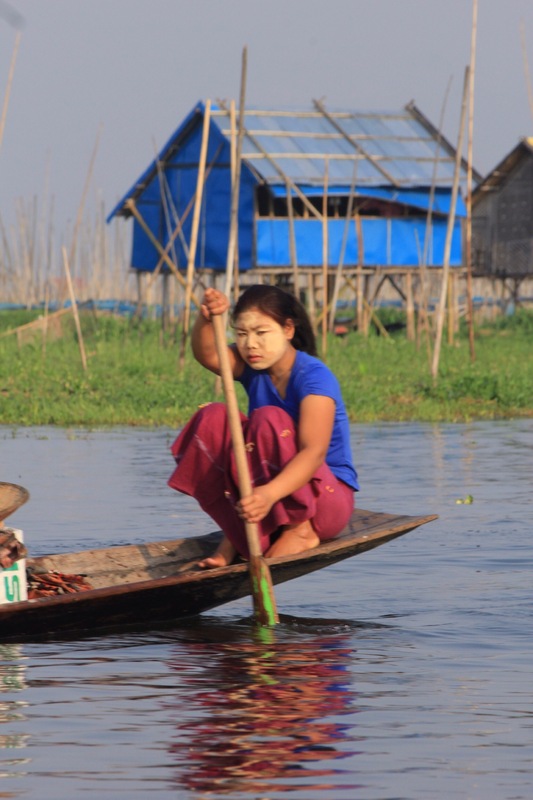 We were determined to visit Inle Lake before then. All this meant we needed to get north, fast. We’ve not done too much by public transport yet… Just a couple of cargo trains in Thailand in and out of Bangkok and we had read many times that the trains in Myanmar are slow, unreliable and uncomfortable. Bus seemed the best option – but how willing would they be in taking a tandem? There are only two buses from Hpa-An to Mandalay (12 hours) and both are night services leaving 6pm and 6.30pm. 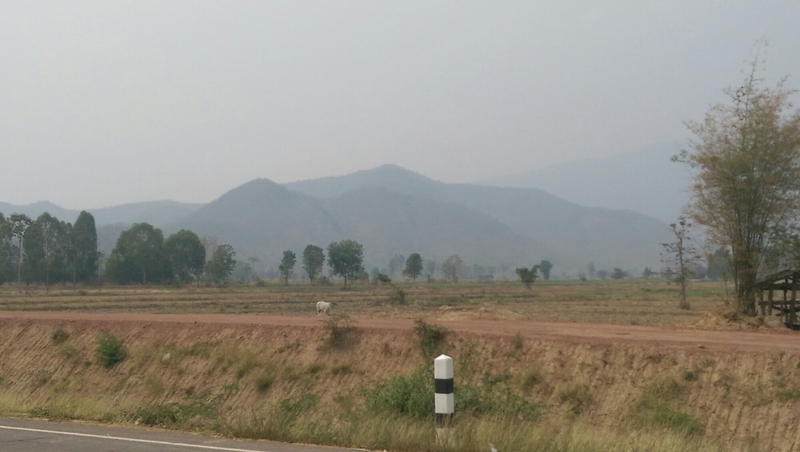 There is a decent motorway servicing Bago to Mandalay which makes up the majority of the journey. We wanted to be dropped off near Meiktila so we could head East form there. Our hotel called a bus company and the request to take the tandem came back negatory. Unperturbed we agreed we’d hitch hike instead and went and had dinner with some other cycle tourers. 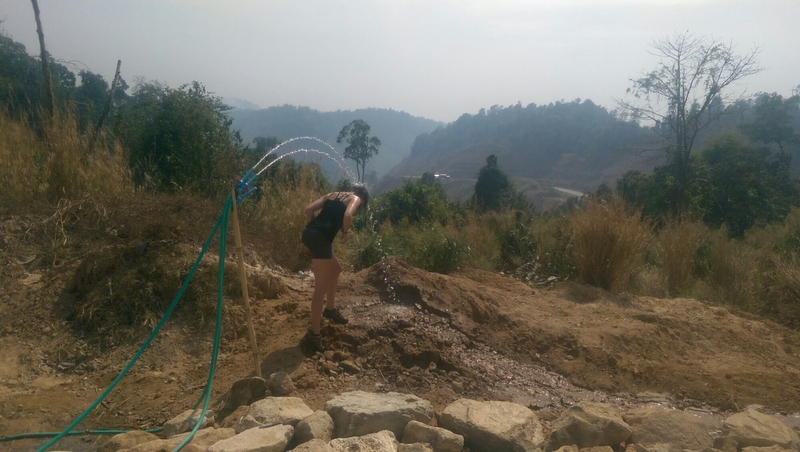 The only worry was that we needed to hitch over 700km… and Paddy’s stomach hadn’t been feeling too good for the last day either…. 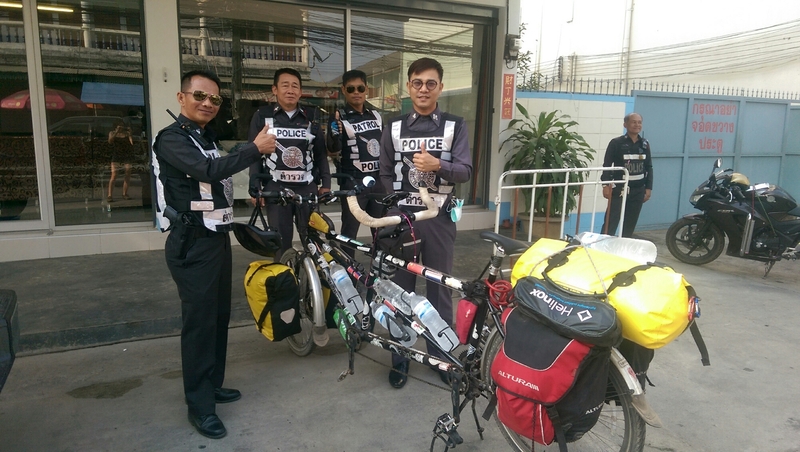 Hitch Hiking in Asia is very easy and although we hadn’t tried it yet, we’ve heard many stories of other cycle tourers sticking their thumb out to grab a ride. ‘People always stop’ said one cyclist to us. Before we left the next morning to start our hitching we stopped at the bus ticket kiosk in town to see if the bus company could be persuaded a second time. Whether the guy was more forceful, or whether he just knew the right people to call, this time the bus company said yes to the tandem, as long as we removed both wheels. 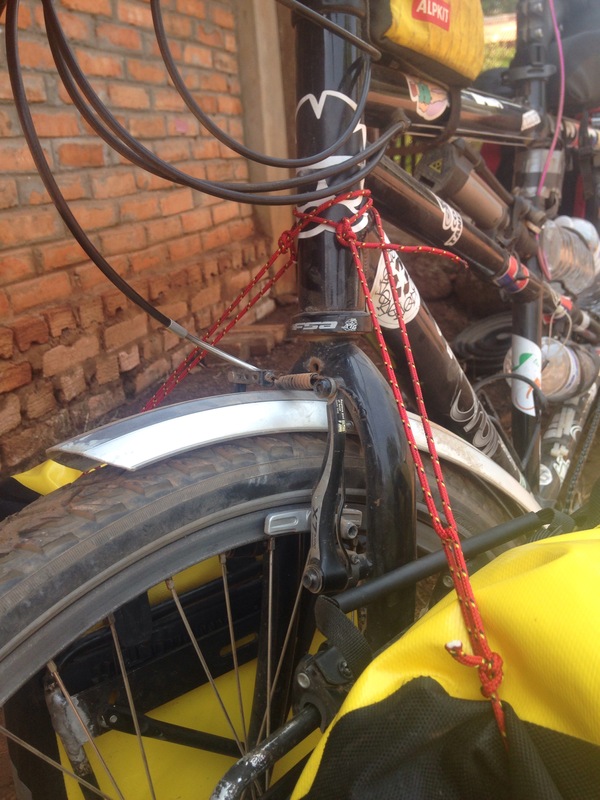 Faced with either a 10 hour bus journey or hitching for 24 hours in trucks we knew which one we’d prefer, the only sticking point was that the tickets were 15,000 kyat each + 10,000 for the bike. Our daily budget here is 35,0000. In the end we bit the bullet and went for the bus. Despite wanting to experience the hitching, we agreed that maybe covering 700km on our first hitching trip with tandem might be an overstretch. We arrived at our stop just outside Mektila at 5.30am. 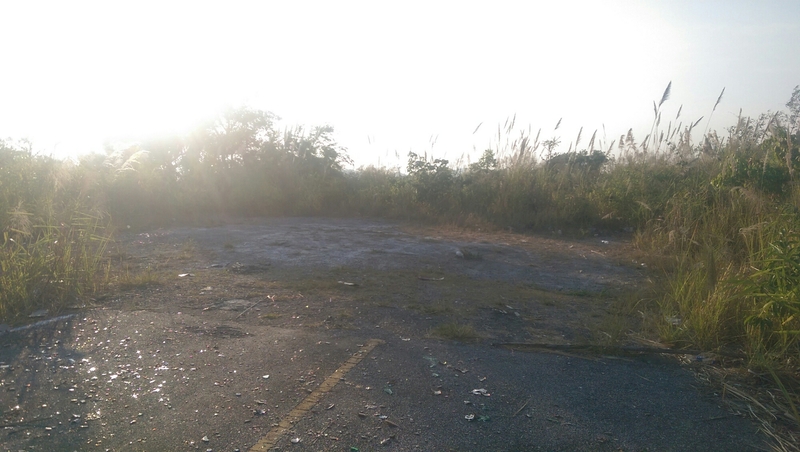 We were dropped off on the hard shoulder 12km from Mektila. It’s not as bad as it sounds, this motorway is famously deserted (there are myths that kids even fly their kites on it apparently) and we set up the bike under the friendly eyes of some Motorbike taxi drivers who race each other up and down the tarmac. Time to get to Kalaw! A 6.30am wake up ensures we get off to a good start the next morning. We pack up the bike and enjoy a great breakfast accompanied by tea (of course!). We paid 75p each!!! 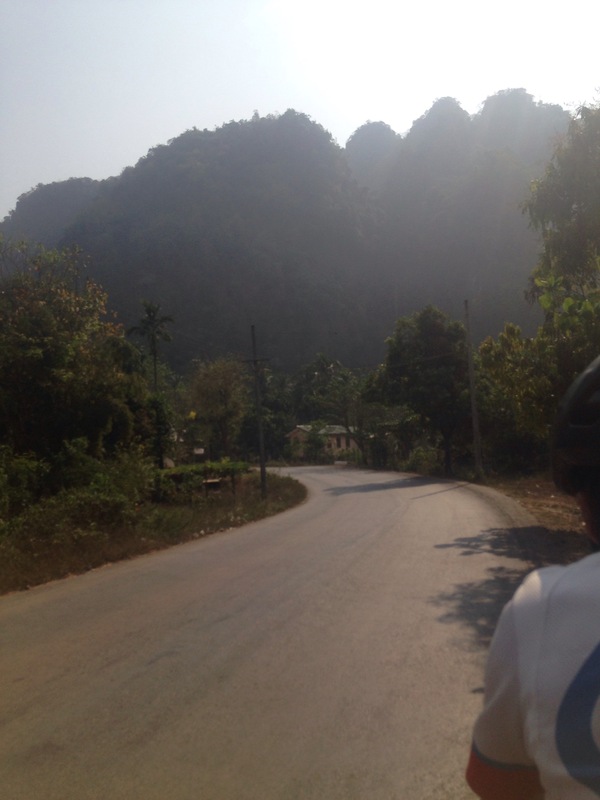 Kawkeireuik is bustling as we cycle out towards the road which will eventually lead to Hpa An (105km). A morning mist hangs in the air making everything look very mysterious and dreamy. It is very humid! Golden pagodas litter the countryside everywhere you look and cattle and goats meander lazily across the road slowing up the traffic. Kayin State is very beautiful. We get stopped at a check point where we’re asked to handover our passports, this becomes a regular occurrence throughout the day but the guards are very friendly and even offer you energy drinks and replenish your water. 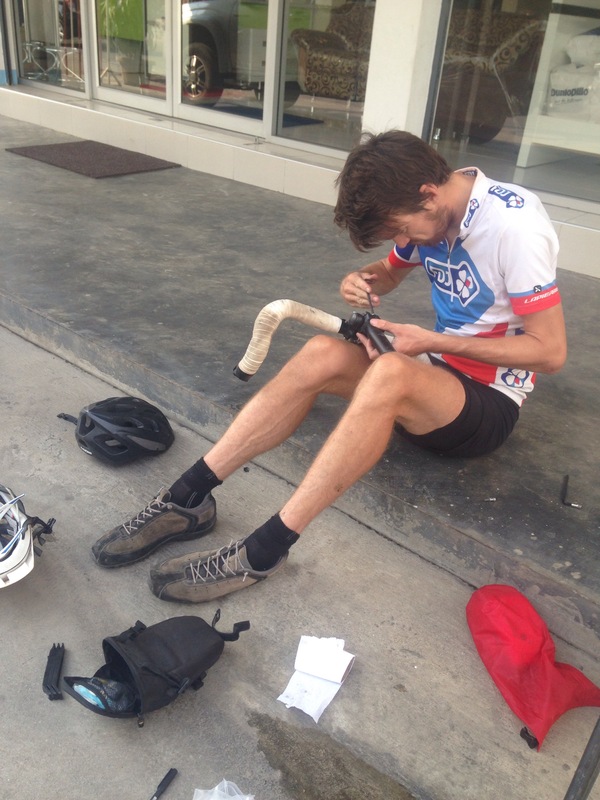 10km in, Paddy notices that one of the front ortlieb panniers is hanging wrongly and so we’re forced to stop and diagnose the problem. One of reasons to invest in top end gear such as ortlieb is to ensure you minimise the rips, tears and breakages that are inevitably going to happen while touring. Our ortlieb panniers are not supposed to be used on a front rack strictly speaking but we still didn’t expect them to break this early on into our trip… After doing some reading it seems others have found the same thing! Paddy’s engineering brain and lifelong experience sailing comes in very handy in these situations… I watch him designs a purchase and pulley system with our washing line rope which holds both panniers to the frame and yet allows the handlebars to turn without the rope loosening… I learn a lot from just watching! We press on and finally make some headway. It’s very flat but the road is very bumpy which gets tiring. It’s amazing how much time Paddy and I currently spend discussing the various virtues of different road surfaces! 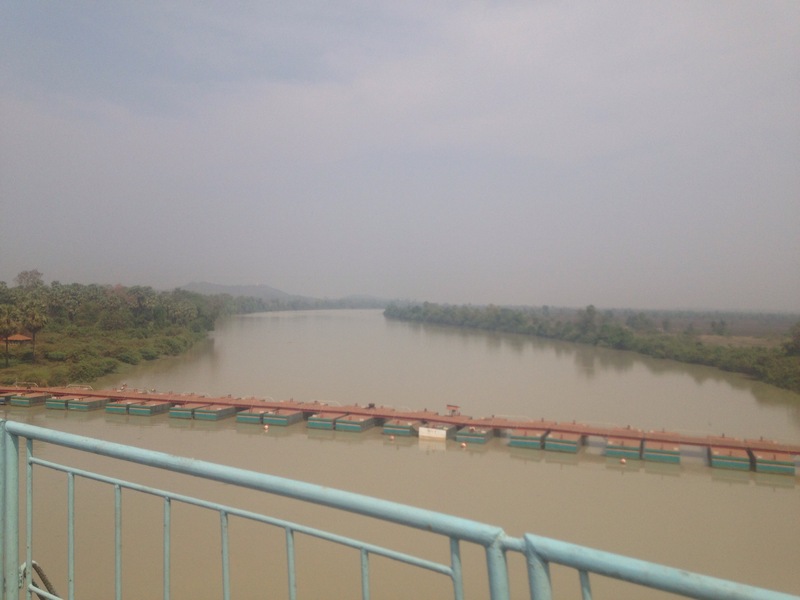 Myanmar has some HUGE rivers and we cross a large bridge over the Hlaing-bwe river just after the second check point. Cycling over is slightly precarious due to the bike tyre width gaps! We stop for lunch and are served a huge pile of steaming noodles (helpings in Burma are much bigger than Thailand or Cambodia!). It’s tasty but clearly mixed with a lot of MSG, an agent which is still used a lot here. It’s served with a tasty watery soup containing garlic, cabbage and chilli. Onwards again, and by 3pm we’re only 15km from Hpa-An but we decide to take the more scenic detour left (after the town of Ein Du) which carves it’s way through the impressive rock formations west of Mount Zwegabin (750m) passing the Lumbini Garden where there are thousands of Buddha statues placed in perfect lines amongst the trees. It’s a great detour, shade covered and quiet, and the mountain top pagodas are incredible! How do they build them so far up! 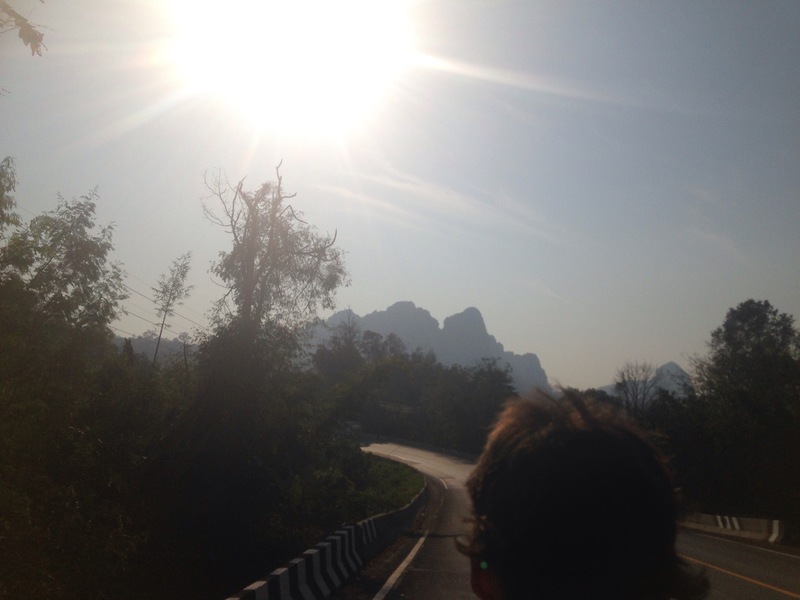 We reach Hpa-An a large town which sits on the banks of another large river, the Saluen, at roughly 4.15. We find a hotel and meet another cycle tourer, Jolie a primary school teacher from the Basque Country in northern Spain. She is brilliant and gives us lots of tips for cycling through China and even presents her used map of Chuan State. We need to get north towards Inle Lake over the next two days. Cycling this isn’t an option as its over 700km so we will need to investigate bus possibilities or perhaps hitch hike up to Meiktila. We pack and leave early the next morning but our early start doesn’t last long as we need to search and buy for a number of items before crossing the border. Pliers (so P can fix our stove), water, snacks, sun screen, mozzie spray, and, most importantly, breakfast. We split up and manage to get everything on the list. While I’m walking back from the market laden with bananas, nuts and chocolate I spot the parked bike and smile. Paddy has found a super safe spot for the bike while we eat! It’s a short 15minute cycle between Mae Sot and the border checkpoint. We’re through easily and then spend a long time trying to extract cash from the ATM… Neither of our Caxton cards work, nor our credit card. We’re not the only ones who are experiencing problems… In the end we exchange our leftover baht (roughly 3000) on the street and get a pretty good exchange rate. At least we have some Kyat for the next few days and we always have our wad of pristine US Dollars to fall back on if and when we need them. So onwards towards Kawkeireuik which is our intended end point today. It’s roughly 45km from the border. First we need to climb more mountains though so we fuel up. It’s the worst food we have had on the trip – paddy’s isn’t so bad but my spinach curry tasted like a mix between a cow pat and gone off fish. We hope these arent the standard flavours that will accompany us throughout our month in Burma! We are cheered when a large wedding party drives past. 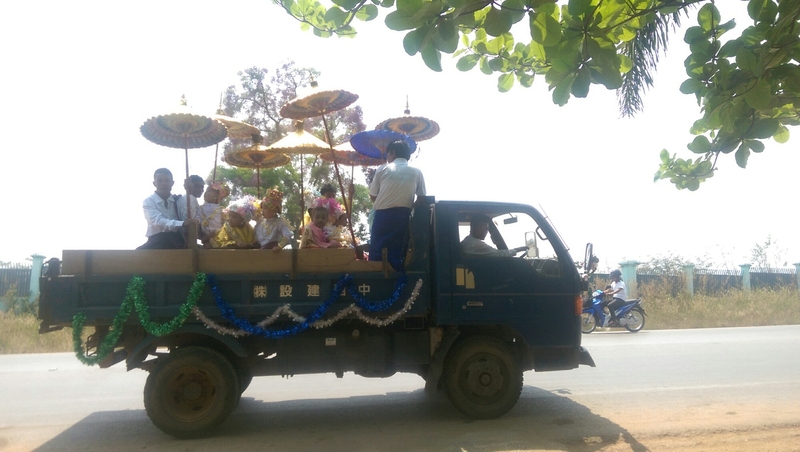 Cars extravagantly decorated with gold parasols and streamers. A huge truck piled high with speakers brings up the rear, some very cool techno music blasting out and four young men dancing their hearts out on the roof. 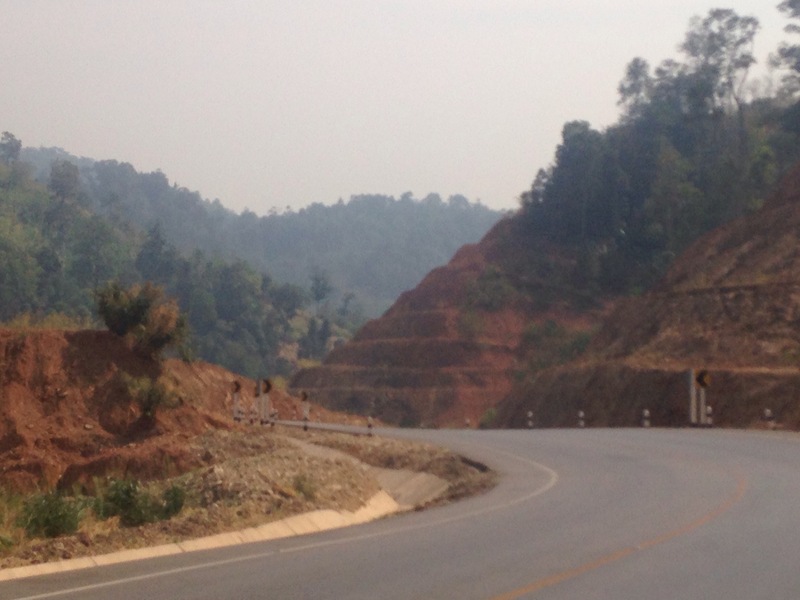 Until 2015, the only road servicing the border to Myawaddy/Mae Sot was a very narrow track. 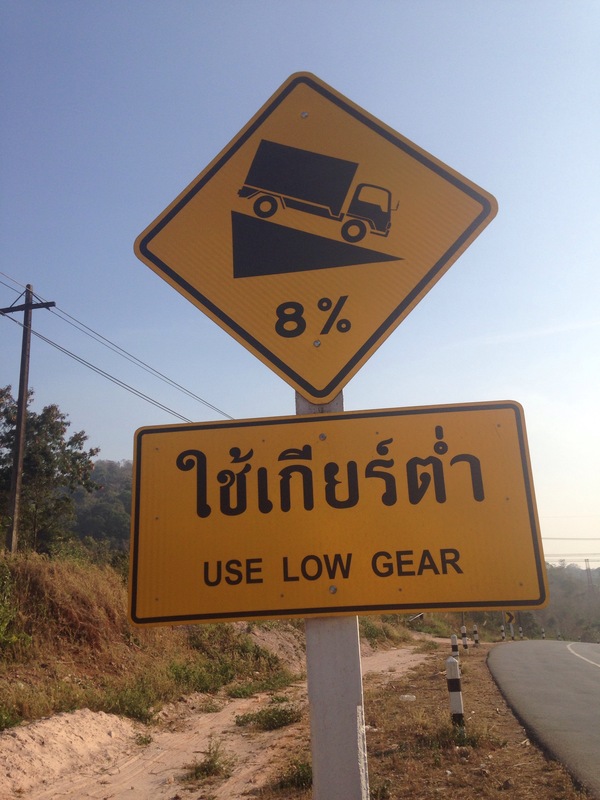 It was so narrow, bumpy and steep that the authorities only permitted a one way traffic system. One day the traffic could drive away from the border, the next day towards! Last year saw the opening of a brand new highway which cuts a much more direct route through the mountains towards Kawkeireuik. When Paddy and I got to the fork in the road which signifies the start of both these roads (both direction signs simply read ‘Kawkeireuik’) we were oblivious to the information relayed above. We simply gambled and took the left fork – this ended up being the new highway, which we were very glad about in the end as the old, we later learn, is longer, bumpier and steeper. 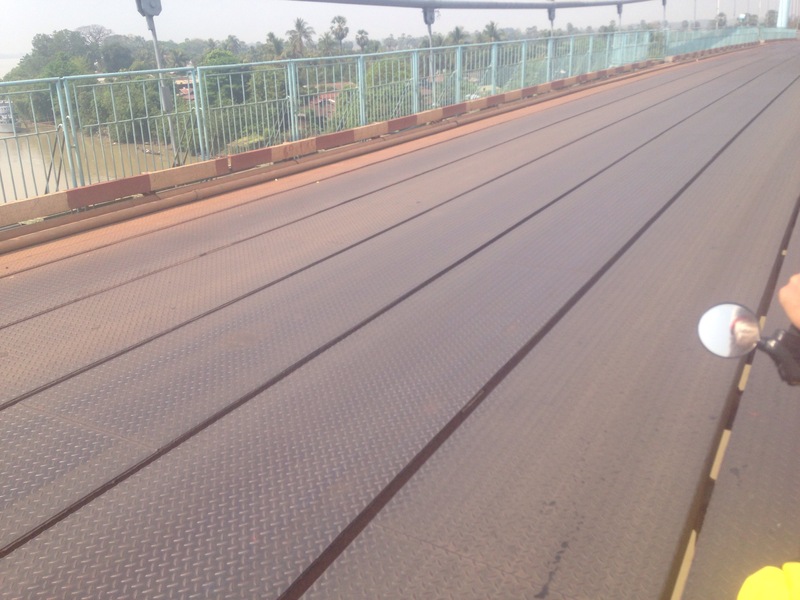 The road surface is brand new with a decent hard shoulder. There’s also only 2 major climbs (and they are tough) but then we reach the summit and start to slowly wind our way down, spectacular jungle on either side, eagles circling high above. The road itself is pretty impressive engineering wise, it follows a natural valley through the mountain but has been literally carved into the mountain side. As well as the road, the landscape also carries the unmistakable signs of some extreme deforestation. All that prized Burmese teak will soon be gone! It was fairly busy on the road (if you take the right fork you get a lot less traffic) and we saw a number of trucks and buses broken down on the side of the road, bits of engine strewn across the road. Burmese drivers are a bit like the Vietnamese. They like to overtake but they beep to let you know they are coming! We also gets lots of beeps and waves as they drive past. It’s very hot and we stop to take a quick head dunk to cool down! We eat dinner with two other cycle tourers that evening – Jo a veterinary student from Japan and Victor a retired consultant who lives in Perth.The food is thankfully excellent this time and everyone seems to have great English. We eat in semi-darkness as there is a power cut half way through dinner. We all retire early, tired after the hard day of climbing on our first day in Myanmar! There are many options for navigation. Paper maps are touted as the pure way to go, GPS units are common. We have gone for using apps on our phones and we are very happy. The apps can eat the battery but we can charge with the battery pack if needed and typically we just use the phone to check we are on the right road, check the distance to the next turn and then switch it off. The bike computer tells us our distance travelled and therefore when to switch the phone back on. I do like the idea of paper and a compass but there is enough other challenges we face and I also think we get the most from the country by using the app to choose the best routes. For example we often see a nature reserve/river/waterfall/hotel/temple on the map and divert. We primarily use OSMplus on the HTC phone. The app was around £2 and the maps are open source. You download country by country and store on the inserted micro 64GB SD card. The files are big and Wikipedia entries, contour lines and hill shading are downloaded separately as big files. The app does route planning, and will do spoken navigation but we tend to pick our own roads. Lately I have been exporting a planned route and trying to upload it to an app called GPS visualiser to see elevation/distance plots like in the ‘tour de france’. Having a profile of your next 7-10 days is really handy for planning when and how you will tackle those climbs. We back this up with MotionX-GPS app for the iPhone. It uses the same map source but we’re limited by storage on the phone and it has slightly less functionality. I’ve been looking for better iPhone apps but the storage problem really restricts things. We also use Google Maps, especially satellite view to check potential camping spots sometimes and get a feel for the countryside. But that needs data which we usually don’t have. Finally we do try to carry a paper map for the country we are in. It has been most useful for showing people where we’ve been! It’s nice to be able to swap maps with cycle tourers going the other way when we can. We carry a compass just in case too but have never needed to use it.